India’s most populous city overflows with history, culture, people, commerce and religion. For visitors, the opportunities to explore and experience this urban wonderland of the Indian subcontinent are more vast than the hours in a day and days in a year. That being said, one of the city’s most certain points of fascination and beauty are its many temples. The history of India cannot be told apart from also telling the history of the country’s religions. While the country is still overwhelmingly Hindu, it gives a wide berth to other religions both according to law and custom. Regardless of your own religious leanings — or lack thereof — the city of Delhi has a wealth of religious sites that both the devout and the skeptical will find impressive. If you’re looking for a sense of the sacred amidst memorable and one-of-a-kind architecture, visit these seven temples on your next holiday to Delhi. This temple complex is a rich display of thousands of years of culture, religion and architecture. 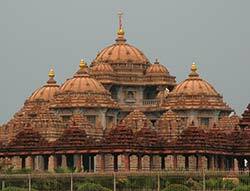 Pramukh Swami Maharaj began work on the temple with 3,000 volunteers, who laboured to assist 7,000 artisans in order to build it. Over 70 percent of all the tourists who venture into India find their way to this temple since it opened in 2005, and it offers much more than just a worshipful visit. It also has a theatre, a musical fountain and a vast and verdant garden. This famous Hindu temple is dedicated to the Goddess Kali, who is an incarnation of Durga. While worshippers visit the temple throughout the year, the festival of Navratri — which occurs twice a year in spring and fall — is a nine-day festival that marks the zenith of the prayers, devotion and celebrations that preceded it. The temple itself is made of marble and black stone, and it is one of the most important temples in all of Delhi. 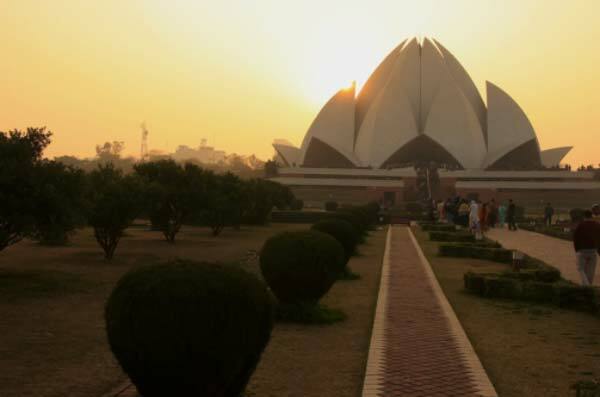 The Baha’i Temple in Delhi is most often called the Lotus Temple, because it is shaped like a lotus flower. Over 70 million people have toured the temple since it opened in 1986, making it one of the most-visited sites in the entire world. Made from white marble and lit up like an origami moon each night, the Lotus Temple is a place where people of all faiths are welcome to worship. Its grounds are also lovely, with serene gardens and still ponds and plenty of green space to sit and relax or indulge in a picnic. This Hindu temple spans over seven acres and is dedicated to Laxminarayan, or Vishnu, the Preserver and his consort, Lakshmi. Mahatma Ghandi inaugurated this temple on the condition that people of all castes be allowed to enter and worship in it. Its side temples are dedicated to Shiva, Krishna and Buddha, making it a truly multi-cultural and inclusive religious site. It has lush gardens and many shrines and fountains and is one of the most popular temples in Delhi. Sai Baba of Shirdi was a holy man and saint, particularly revered in India, although he is venerated all over the world. A teacher of both Muslim and Hindu traditions, but a man who claimed to follow neither, Sai Baba had no love for material things and sought only self-realization and union with god. He taught love, charity, devotion to god and guru, forgiveness and inner peace, and he did not care about anyone’s religious affiliation or caste. While Sai Baba temples are commonplace throughout India and the world, this saint’s life and teachings are more than enough of a reason to visit Delhi’s Sai Baba Mandir. Established in 1974 and spread over 60 acres, the Chattarpur Mandir is the second largest temple complex in all of India. Dedicated to the goddess Katyayani, the complex features over 20 temples of varying sizes, divided across three complexes, and it is entirely constructed out of marble. The temples of Delhi beckon. From the sense of awe and serenity that pervade these sacred spaces to their designs and luxurious gardens, peace of mind will accompany wonder as you immerse yourself in this part of India’s history, culture and self-understanding the next time you find yourself in Delhi.